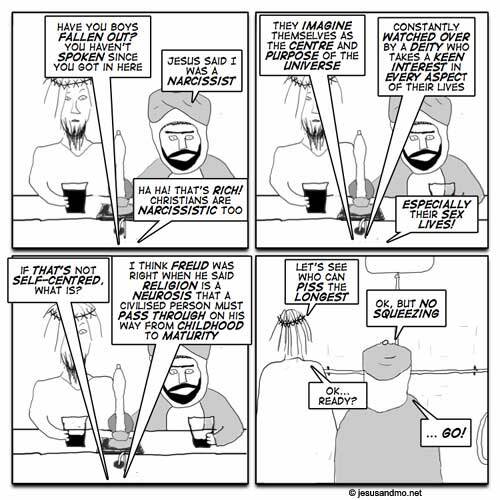 Jesus and Mo will be back in August. and i am told, balls too. Yep, brains and balls. Assuming you’re a dude. I really have no idea. It make take a while before the expression, “You’ve got ovaries” comes to have the same cachet. And then there’s the non-sexist, “You’ve got gonads”. I think it may be even longer before the feminist blogs start promoting this as part of the language ‘adjustment’ strategy. lolol I think these comments were funny enough! Ã¢â‚¬Å“YouÃ¢â‚¬â„¢ve got gonadsÃ¢â‚¬Â is such an eunuchistic comment! “religion is a neurosis that a civilized person must pass through” ummm no. Way to have a global outlook. There exist persons raised without religion. He didn’t mean everybody, he just meant having religion is a neurosis of the immature. You have to grow out of it to become civilized – doesn’t mean you must have had religion if you’re now civilized any more than you must have been sick if you’re now healthy. Yep Rider’s right. First you are religious, then you become an Atheist and then lastly you become a spiritual scientist. Next step is dematerialization! Hey look! It’s the British / Not American spelling of Centre!